Favorite is gorgeous! 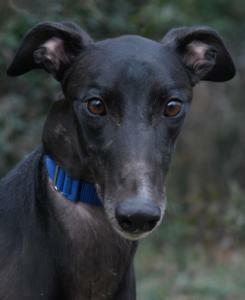 Tall, dark and handsome with a shiny, black coat. He raced at 77lbs and retired from the Orlando Track. Favorite's birthday is 10/1/09 so he is young, just 2 years old. He is happy, playful, friendly and loves everyone he meets. He didn't pass his first cat test but did pass his second. He does respond to correction so we think he will be trainable with cats and we will be glad to introduce him to your specific cat since he had mixed results with his first two tests. He was fine living with a small Italian Greyhound in his foster home and seems like the type that will get along well with other dogs male or female. He was too interested in chasing a fuzzy pomerianian he met though so my not do well with very small fuzzy dogs. Favorite has discovered toys and loves to play with them - maybe a little too much sometimes. He seems like a fun guy that will be an easy first or 4th greyhound. Favorite was sired by Tony's Oracle. He pulls on leash when excited and needs reminders sometimes.